Last year, I reviewed a game that I played on July 4th: Battle Cry. My son and I played it because of the holiday. The Battle of Gettysburg was fought 150 years earlier over the first days of July. This year I thought I would review a family game that tied in with the 4th. 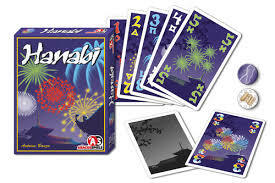 Hanabi is a game about putting on fireworks displays. It has won high praise, and is being highly touted as a fantastic family game within gaming circles. However, I think the last three words are important. You can't see your own cards! Players hold their hands backwards, so that a player only sees everyone else's cards. On a turn, a player can provide limited information about either the suits or values in one players hand, discard a card, or play a card to the table. The game forces discards, and only three wrong plays to the table can occur before the team loses. This is a great idea for a game, and I had a "blast" with it. But I am not sure how it would play in families. First of all, while the game gives an age range of 8+, I can't imagine too many 8 year-olds that could really wrap their heads around this. It's fairly "thinky"; not what one would call a "light" game. It doesn't surprise me that it's a "family game" in the gaming world. Kids in the gaming world often catch on a little earlier due to their gaming experience. But for casual family play, I would suggest something else. This is the co-op love child of Mastermind and Headbanz. It's great for families with older children. While the under 10 crowd might struggle, this would be great for older kids. I always like cooperative games for families, but sometimes they can suffer from "dominant player syndrome", where one person is bossing everyone around. That's impossible in Hanabi. Not only is there too little information, but it's flat out against the rules. As a result, everyone feels like they contributed. Puzzle people will like it. My wife is a puzzle person. If we sit down at the table to do anything other than eat, she's going to pick a jigsaw puzzle for the activity. There is a lot of "puzzling out" the logic in this game, so it's great for people who are into that. It's $10 and fits in your pocket. I know a lot of people have sticker shock when they see the cost of modern board games, but they are well worth their value. This one is downright cheap at the price, and it can go anywhere you want it to go. The game plays very well, and is a lot of fun. I really enjoyed it. Despite my reservations about its appeal, I can recommend it as a solid game. Thematically, it's a great fit for the 4th. It can go to the fireworks display in your town, and you can play it on the blanket while your waiting for the show to start. Have your own little fireworks!